Dive Log: Isla Angel de la Guarda, Northern Sea of CortezOn my recent photo workshop, with Bluewater Photo aboard the Rocio del Mar, I was able to capture some very interesting territorial and courtship behavior. On our last dive of day one, while our group settled in and started surveying the rocky reef to photograph the local reef fish, eels and other reef inhabitants, the critter hunter in me decided to drop down over a ledge, to the sand and rubble flats at 55 feet, to see what I may find. What was otherwise a barren desert just off of the reef, soon came alive once I hunkered down, hovering at eye level to the bottom. In the fading light of dusk, I quickly noticed a profusion of tiny fish that popped up everywhere putting on flashy and colorful courtship displays. Needless to say, I spend the whole dive within a 20-foot radius on the sand, in the middle of the action. 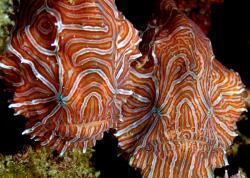 Bluewater Travel can help you plan and book the perfect Sea of Cortez dive trip. Visit BluewaterTravel.com for more info. Peering out from a worm tube. 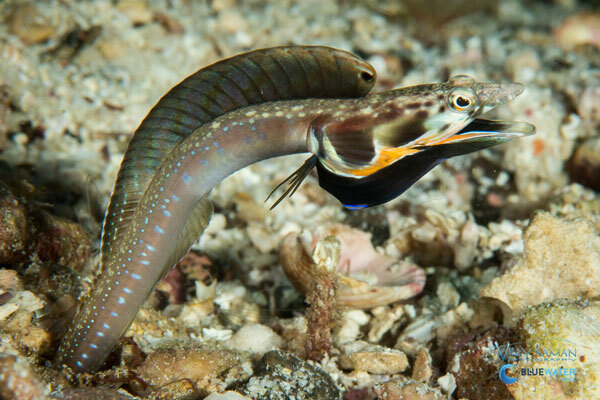 The unassuming Orangethroat Pikeblennies, which often inhabit the vacated casings of tube worms, peered out of their holes, watching for predators. 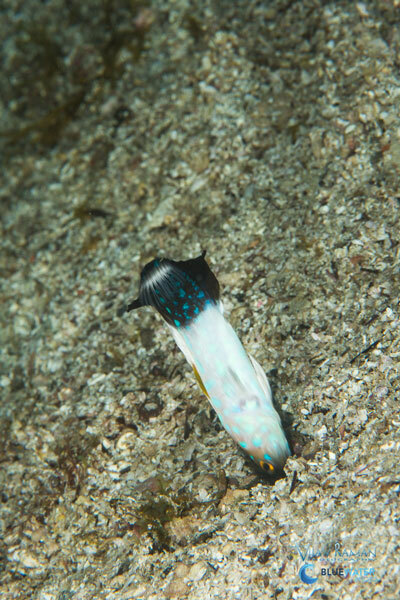 The males, seeking the attention of nearby female suitors, would occasionally dart up out of their holes, flaring out their dark dorsal fins and brightly colored orange, black and blue accentuated throat flap, with mouths agape and a quick and quirky, lurching dance before rapidly retreating back into their burrows. 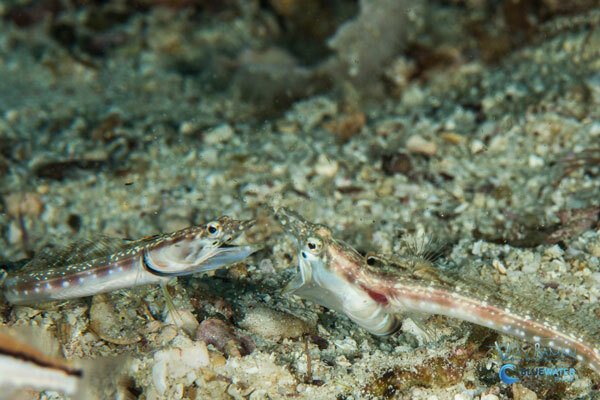 Other unsuccessful Pikeblennys fought to take over a better spot nearer a suitor. 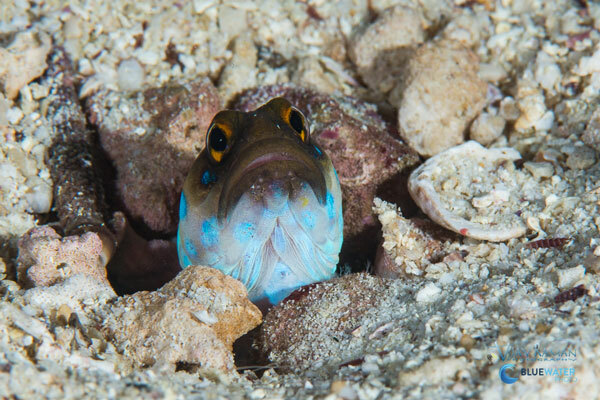 Within this mix, were neatly manicured burrows of the Blue Spotted Jawfish, distinguished by their circular pebble wall at the entrance of their hideout. 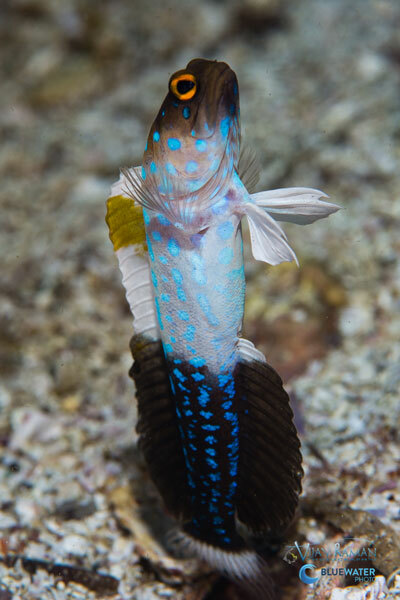 Blue spotted jawfish playing hide and seek. 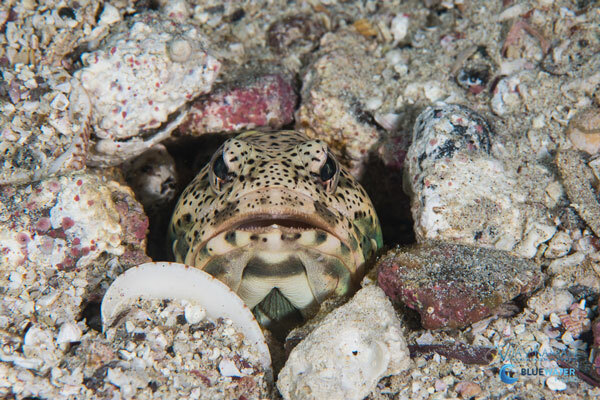 When not engaged in household chores of clearing sand out of their burrows, the endearing little jawfish would sit with just their heads poking out of their holes, watching their surroundings. Every minute or so, the male would suddenly pop out of his hole, flaring out his fins with a flash of black and white with iridescent blue spots, to display for only a second or two before darting backwards into its burrow. 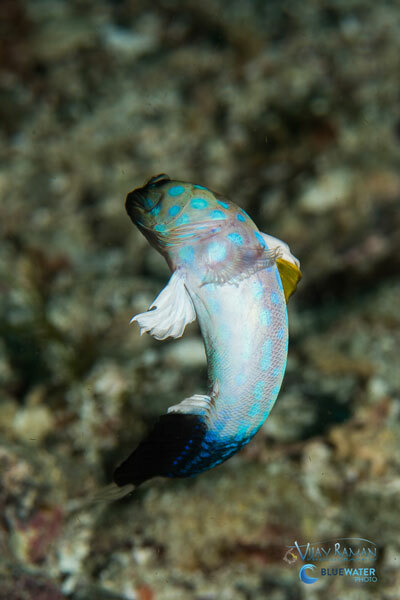 In the very last split second, almost imperceptible to the eye, the jawfish tucks in and turns tail to dart back in head-first. Darting back into the hole. 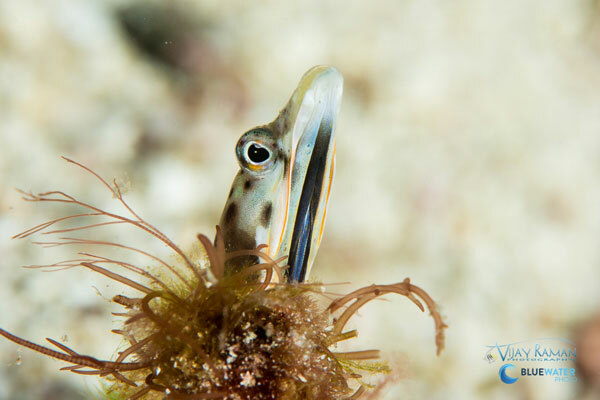 Jawfish are mouth brooders, meaning that the male holds the eggs in his mouth until the fry are ready to hatch. 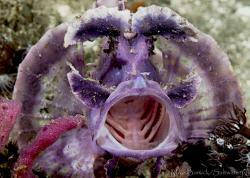 On another dive we were able to photograph the larger Fine Spotted and Giant Jawfish with eggs in their mouths. 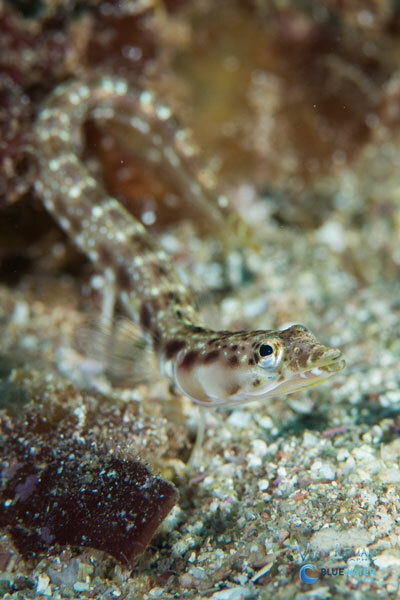 We saw some jawfish with fresh yolky yellow eggs and others with gray eggs ready to hatch, eyes of the fry visible. 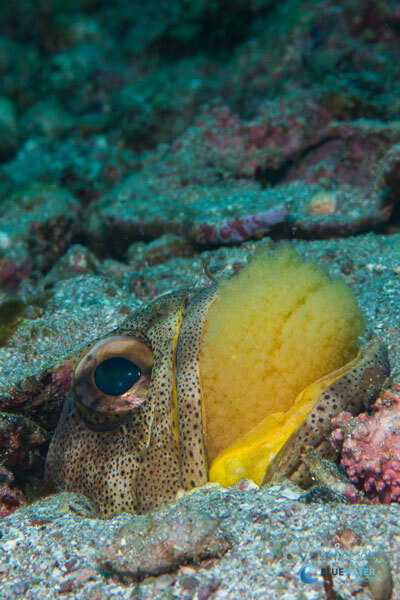 Every few minutes the fish would push the eggs out slightly to oxygenate the eggs, giving the patient photographer a chance to capture the egg mass. It becomes a game of wait and watch - to get the shot right at the peak of action. 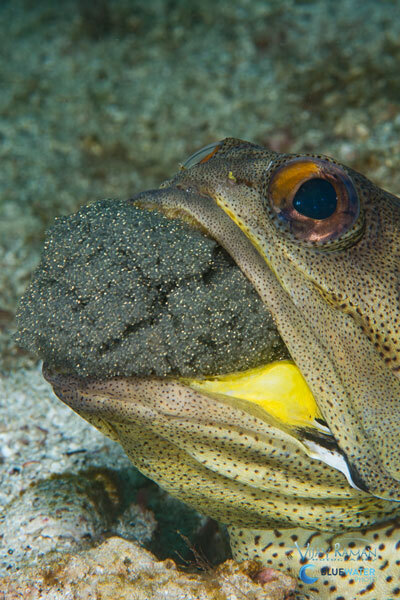 Jawfish with mature eggs, ready to hatch. To shoot these benthic fish I used a faster shutter speed to catch the fast action and often a larger aperture, for a shallower depth of field, to separate my subject from the sandy background. Getting really close also helps to isolate the main subject and blur the background. The rest is patiently waiting for the right moment. Excluding the Sea Lions and Whale Shark encounters, this dive turned out to be one of my favorites of the trip and straying off of the reef into the seemingly barren sand really paid off. 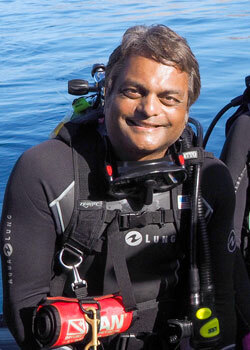 Vijay Raman is an avid underwater photographer and has been shooting underwater since the mid 90’s. He is the sales manager for Bluewater Photo and also a Bluewater trip leader. His award winning images have been seen in various print and digital media. To see more, please visit www.vijayraman.com. All photos taken with the Nikon D7200 in Nauticam D7200 housing, with the Nikon 105mm VR Micro lens and Sea&Sea YS-D1 strobes.